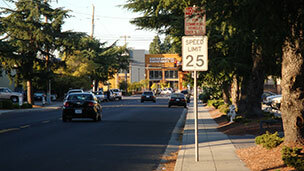 For the next tango lesson description visit our Tango Palo Alto home page. This list is what we did in the past. Annual Tango Party at Palo Alto JCC on January 4, 2014, Saturday ! Dance Party starts at 8:30. Two dance floors: dance on stage. "Secret of "Pivoting inside the body" of Milonguero Style. Enables you to dance wonderfully without actual pivoting. Great for outdoors and crowded places." Potluck. Bring wine, food to share. Coffee and tea provided. There is parking under the complex. Entrance from Fabian St. Plenty of Parking on Charleston 5 min away. There in entrance to the theater close to Charleston. The theater is called "Cultural Arts Hall"
Wonderful fun party with live music and improvised performances ! Welcome to our Argentine Tango classes ! 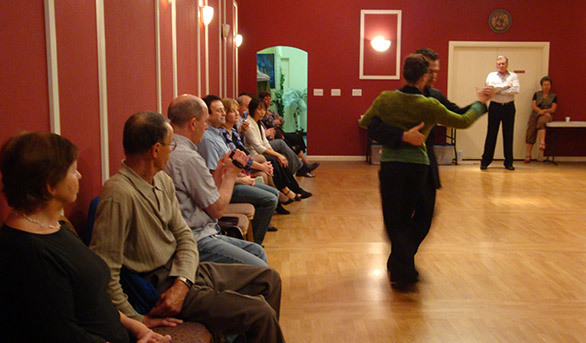 On Monday, at Samovar at 7:30 we have a class called "Social Tango". It is not quite a beginner's class in the usual understanding of this word. Many advanced topics are slightly introduced so that dancers of all levels find it useful. For example, last Monday we were learning Milonga ! For men, the material which is presented here is enough to become a popular dancer in San Francisco Bay Area. You only have to work on quality. But women have to know more.. The second class at 8:30, "Intro to advanced level" trains dancers how to move like in Tango. Knowing some figures is very far from being able to dance well. Training is required, and that is what the second class is about. Since Igor Polk is the master of all tango styles, the material presented is guaranteed to contain only the most important and truly important topics, so that the material you learn is the most optimized for the money and time you spent. One of the most important aspects of learning tango is to practice with each other and to dance with a master. Here is your opportunity! Igor Polk is dancing at the practica from 9:45 to 12:00 and longer if needed. Men and women alike, leading and following. Per hour of a lesson, you should have 2-3 hours of practice. There is a myth in tango community that a man should know much more than a woman. This myth is originated from the difficulties which men meet at first. It is true, for men it is kind of, three times more difficult to start dancing. But does it imply that for women it is simple ? Absolutely not! After men have learned how to lead ok, they are free to dance with anyone they want ! But women can not do it. In order to have good dance they have to adopt to a variety of styles and personalities of men. It means they have to know much much more than men, and dance much much better. So, use this opportunity to learn from a master who knows all the styles and danced with many best dancers, energetic and seductive, slim and plum, nuevo, milonguero, or salon. Igor Polk surely knows what you need. Come and practice, it is only $5 an evening ! The answer is simple. Because, Igor knows how to dance tango. He knows it from all sides and from inside out. And which is the most important, Igor developed a complete system of argentine tango. Systematic approach is the key to success in every single activity of human kind. From Egyptian pharaohs to modern software development the systematic approach grants confident victory. Welcome, and be sure that every move you learn is a milestone in your direct path to success on the dance floor. You will meet this move many times in your tango life with many variations and every move serves as a gateway to others, and together they fit as a puzzle in a wonderful picture of the tango dance, social success, and satisfaction accompanying it. On Wednesday, the 2 hour workshop is a relaxing immersion into tango in the wonderful Yoga room at JCC at 8:00. Here we have a little more time to cover a topic completely. This class is planned to become an advanced class, but for now it is perfect for all levels, and we have a friendly teem of dancers there. Very nice class ! On Thursday at 8:30 at Fantasy Dance the class is different. We often have visiting students, so Igor has to find the language suitable for those who might study with somewhere else. It is difficult, since these people mostly have vague idea of Tango rhythm, structure, feel, purpose, energy and movement. So the class is called "Tango Secrets for those who dance". For us, it is a review class, but often with introduction of the fantasy, fancy, fun movements. The quality of the practica and music afterwards is close to milonga party. Igor welcomes dancers from outside, especially those who value quality dancing - nuevo and milonguero dancers. And guess what ? Igor Polk is practicing with students ! Another way of spending hours of learning with a master. People stay longer here, usually we finish at 12:30. One of the best tango choreographers and performers, Jorge Nel and his wife Milena will give a workshop at our Samovar place. Also Jorge is selling dance shoes of his own design. They are good, comfortable, reliable ( my best shoes ), not expensive. Half of all tango dancers in US are wearing these shoes. The topic of the workshop I chose: "Artistism in tango". This is not quite what most teachers teach, and even not what Jorge himself often teach, his specialty is Milonga of which he teaches 3 styles: Traspie, Canyengue, and Lisa. But I can not miss this opportunity to learn from one of the best world choreographers and most fun performers of the dance. I convince Jorge to present you, whatever level you are, to show you how to impress you friends and yourself with artistic side of your dance. I am not sure if Jorge will teach beginner's class from 7:30 to 8:30, we will see. If not, I'll teach it. By the way, he is teaching Milonga this Saturday at the Nora's milonga in Emeryville. 8:30-8:45 - "shoes on sale"
8:45 - 10:15 - The workshop "Artistism in tango", Jorge and his beautiful wife Milena. BIG Tango party on Feb 28 !!! Brigitta Winkler is nationally renown tango teacher teaching tango for about 25 years. She was one of the very first Europeans to learn tango in modern times. She is one of the first Igor's teachers. Brigitta teaches regularly in New York, Berlin, and most of her time she spends travelling and teaching at the best tango festivals world-wide. She has visited us in the past. Here are the photos from the Brigitta's tango workshop. Here is Tomás Howlin and Brigitta Winkler dance. Corner of Independence and Leghorn. Do you see the small doors left to the shop? Here it is ! Step in ! Since September 16, 2009 in accordance with our vote, our tango club is called Zina Tango Club in the honor of one of our founders Zina Vladimirski. Copyright Igor Polk !!! No use without permission. 11:30 - Practica for survivors. Free. 11:00 - Practica for survivors. 7:30 - Fundamentals class, $10. 8-Count Basic . So called "8-Count-Basic" tango figure is the only one which has a "step count" everyone agrees upon. It is a must to know. Some people say it is just a teaching tool. But in reality it encompasses the whole tango. It has 3 parts: Salida, Resolution, and Going to Cross". It is not going to be an advanced class where we study enormous wealth of tango treasures hidden in this figure, but still, we put in lessons as much as we can: it should be danced well and we are going to dance it well ! 8:30 - Progressing class, $10. Cross walk and the turn to the left on it. It is a simple and nice turn we have touched the basis of last time. 9:30 - Practica, $5, free for students. 8:00 - 9:30 - Workshop. $15. Turn to the right in close embrace. Workshops with Alicia Pons accompanied by Robert Hauk ! Please, come to Alberto's. There will be no practica at Studio C this Sunday ! 7:30 - Fundamentals class, $10. Alicia and Robert are teaching beginner's class ! 8:30-10:00 - Workshop with Alicia Pons assisted by Robert Hauk, $25. The topic: "Movement. How we produce and transmit movement. Flow of energy between dancing partners, and between dancing partners and the dancing floor. Exercises." 10:00 -Practica, $5, free for students. 8:00-9:30 - Close Embrace Workshop with Alicia Pons. $25. The topic: "Tools for Creativity in Tango - 2 Stops & Suspension"
8:00 - Close Embrace Workshop. $15. The topic: "Elements and technique on the way to right turn" in close embrace. We have good time here and stay later. It is like a little friendly party. 7:30 - Fundamentals class, $10. "Milonga Basic, a class for everyone ! ". 8:30 - Progressing class, $10. Close embrace class !!!! The first close embrace class on Monday ! about 9:45 -Practica, $5, free for students. from 5:30pm to 7:30 starting from January 17. $5. It is in the new nice small ballroom in the downtown. If you are interested or know friends who live nearby please let us, and them know. There could be a class too. www.ballroomandbeyond.com ( please, check the map ). We are starting Holiday season. Isn't it exciting? about 9:45 - Hanukkah party $5, free for students. 9:00 - Christmas party. $5, free for students. We'd like to see everyone who ever stepped on our floors. 9:00 - New Year Celebration. $5, free for students. We are going to stay until they ask as out, meet the new 2009 year, and then we may go to some other place, providing there is one.. Most adventures ones are welcome to Igor's house in Hayward for morning tea. Bring sleeping bags, if you want. Igor has only 2 inflatable beds and 1 sofa. By Igor's invitation, we have a guest teacher Robert Hauk. Following the very successful workshops in May robert will teach us his Milonguero Turns. Here is more information about Robert Hauk tango workshops. 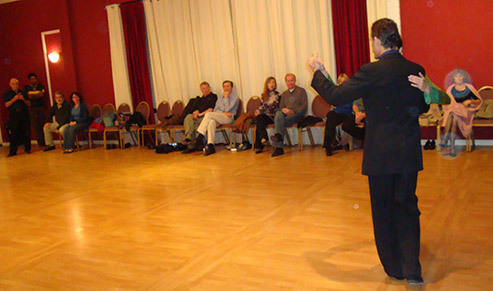 Robert is one of the best social tango teachers in America. 7:00 - Practica and advice from Igor. $Free. Jorge Nel is a wonderful professional tango performer and choreographer, but he also sells dance shoes. He is going to bring us his collection. Also you can order custom-made shoes. His shoes are of good quality and not expensive. Many tango dancers in America wear them. Video: http://www.youtube.com/watch?v=bZFvXgwXdos. The former topic of the lesson was "Have fun with tango!" That is what Jorge is great at. This workshop collected excellent remarks by the tango students. Here is the photoalbum of the tango event in Palo Alto. 8:30-10:00 - Workshop with Ruben "Turns: Orillero Style and Apilado Style". ( Review of turns to the left and to the right in open and close embrace). Ruben is not in very good health, please, come to this workshop to get the knowledge of the master. Free practica to follow. Cubberley Center Auditorium. $25 ($20 for Igor Polk's students). about 9:45 - Practica. $5, free for students. 7:30 - Essential fundamentals. "Orillero" Ocho Cortado. This is one of the figures taught by Ernest Williams on July 23. Come to review. $10 This lesson supposed to be last Monday, but we had 11 women and only one men. Unusual, isn't it :). So instead we did "Major elements of Tango" lesson. 8:30- 9:30 - Advanced Close Embrace lesson with Igor and Teressa: "Variations on Ocho Cortado in simple Canyengue style". "Ernest Williams is the only dancer in US who knows how to perform Canyengue. It is his first visit to San Francisco Bay Area. So it should be historic. Invite your friends ! " And it was. It was the best tango evening at JCC Tango Club !!! Wednesday with Ernest and Maricela at JCC Tango Club was incredible! Photos to come. In the evening on Sunday Igor will be DJ-ing at the Alberto's Milonga. 8:30 - Close Embrace advanced class. Last time Slow-Slow Milonga was an interesting class. You might be shocked a little with rhythmical complexity of the dance, but that is the way it is. There is no other way to dance it. We will make Milonga classes regularly, hopefully once a month where we continue understanding unusual Milonga rhythm and practice suitable figures. Dancing is movements to rhythms. Knowing the right rhythm of the dance makes the whole difference in abilities and mastery. We welcoming everyone to our classes where we discover to you the deepest secrets of real Argentine Tango rhythms. Nora's Tango Week is starting. By the way it is the best time and place to obtain Tango shoes. The selection which is usually present there is unbelievable. Some dancing examples. After our Wednesday's lesson you know what to look for, right? We are going to continue it this week. Osvaldo Centeno y Ana Maria Schapira, Tango. Alberto Dassieu and Elba Biscay, Tango Vals. 2:00 pm. First 2 workshops with Robert Hauk on Tango Milonguero ( in close embrace ). Alberto's Night Club, 736 W. Dana, Mountain View, CA 94041. 3:0 pm. Second 2 workshops with Robert Hauk on Tango Milonguero ( in close embrace ) followed by a milonga. 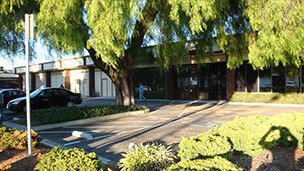 Alberto's Night Club, 736 W. Dana, Mountain View, CA 94041. 7:30 - Extra class with Robert Hauk !!! "Preparation for the workshop". Everyone is most welcome ! $10. 8:30 - 5th workshop with Robert Hauk on Tango Milonguero ( in close embrace ). $25( $20 for members) . 7:00 - A bonus lesson by Robert Hauk !!!. $10. Photo Igor Polk (C)2007 Any unauthorized use of this photo including linking to this image is strictly prohibited. Robert Hauk is one of the most prominent and highly regarded Tango teachers, dancers, and DJs in North America. For many years he teaches and promotes Milonguero style of Tango which is most close to the way Tango is danced in Buenos Aires nowadays and in the past. For the first time Robert is invited to San Francisco Bay Area to teach us a series of 6 workshops covering most important topics of the Milonguero style. 2:30 pm Tango group performance - close view. 8:30 - Moving forward with Tango rhythm. $10. 7:00 - A lesson for club members. $10. 8:00 - Close Embrace class. $10 Turn to the right in Apilado: the second lesson. 4:00 - 6:00 pm at Studio C ( see the map) - Tango Practica! $Free. Everyone is welcome. 7:30 - Essential Fundamentals lesson #2. $10. 8:30 - Show Tango. How to perform Tango. Very simple things we already know made for stage. $10. 8:00 - Close Embrace class. $10 We are going to address the dance as a whole. As you see we put all our effort to give you all the tango secrets we know. But often it is not enough. Everyone is special and to address individual needs at least one private class in several month is very helpful. Igor can help you with this - at his new dancing studio in Hayward, or at the place of your choice. Price is $50/hour/ per couple in Hayward, $60 in any other place. Plus - for men - count your lessons - every 8 weeks of group lessons entitles you for 1 free private class at Hayward. Ladies - not everyone of you used the New Year gift - 1 free private class - hurry up: a new year is coming and this gift is not transferable. 7:30 - Essential Fundamentals lesson #1. You are welcome! $10. This lesson is enough to start dancing tango. 8:30 - Progressing Class. We are going to continue with Giro Caminado to the right. $10. 7:30 - Essential Fundamentals lesson #12. You are welcome! $10. 8:30 - Progressing Class. We are going to continue in the country of Boleos and Ochos. $10. 1. Our 1st Monday class - "Essential Fundamentals" contains simple but extremely important tango concepts we do not have time to go deep at the second lesson. These classes are designed in the series of 12 and contain everything you need to become the best tango dancers in SF. They are complex and designed to be taken repeatedly. At the lesson, one has to concentrate and do it the best. 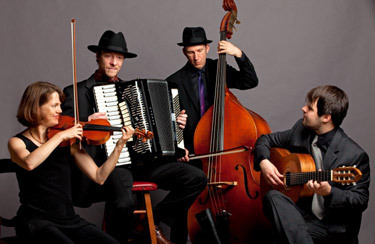 They are the basis of tango technique, feel, and musicality. 2. Our 2nd Monday class is designed right now for the average level of regular Monday students. It means very high. As high as possible. It usually contains simpler material at the beginning, but quickly we go into way more complex staff. We have students who come to our school for more than a year! They've already taken about 60-80 classes and are starting going to milongas (dance parties) ! That is to them we cater the lessons. And we often review what was learned during several previous lessons. It may confuse a little some who missed the previous lessons, but you will come to speed coming to the lessons regularly. As you know, we consider new material very detailed and very deep. Please, do not get discouraged. If you feel the material is above you - take a rest, watch. And ... do not forget to come to the next "essential fundamentals" class. Yes, that is right, our students are starting going to dance parties ! And that is a special time. I know what you are going to meet there, and what you can expect. It rises the plank for us to give you the right material and advice: Igor is dancing at Milongas for 7 years. During his tango-life he took more than 1000 classes, and danced about 3000 hours on the dance floor with best dancers non-stop. Sometimes for 10 hours in a raw. 7:30 - Essential Fundamentals lesson. You are welcome! $10. 8:30 - Progressing Class. $10. 7:30 - Essential Fundamentals lesson #10 including simple Ocho Cortado. Good warm up for the next lesson. 8:30 - Progressing Class. Starting from the turn to the right which we did last time - now - Boleo to the right. $10. 7:00 - A lesson for club members. $10. Very very useful ! Sometimes we are carried away into new elements there. "..there is no mention of tango specifically, but describes a workshop on dance. How much will be tango specifically versus general dance techniques?" Igor: "What about posture ? Posture is the most important thing in Tango ! Everything Alison is going to teach relates to all dances. It is the basis of all. Alison uniqueness is an amazing dancing charm. I’d like people to get at least a tiny bit of it. It makes the ordinary dancing a great one." Igor: This was a fantastic lesson !!! The best we had so far with the invited guests ! 7:30 - Essential Fundamentals lesson. $10. 8:30 - We are going to continue into new frontiers from what we've learned last time. $10. 7:30 - Essential Fundamentals lesson: "Forward Ocho ". $10. 8:30 - This class will finalize the "Turn to the Left" series. We are going to connect the turn to the figures we know, entering it, and exiting it. As well as to perform turns in the line. $10. 7:00 - A lesson for club members. $10. Very very useful ! Sometimes we are curried away into new elements there. 8:00 - Close EmbraceClose Embrace. You know, mastery is in simplicity. How to dance nice on the dance floor. ( Yes, we know, simple does not mean easy nor simplistic ). 7:30 - Essential Fundamentals class: forward Ochos. Welcome everyone. 8:30 - Continuing with left turns with the emphasis how to dance well..
9:45 - practica till late. We have a very very nice and rare guest teacher on April 9, Wednesday ( the next one). Contrary to the most tango teacher, Alison a real professional dancer with the solid education in many sorts of dancing. Pay most attention the way she walks to the partner at the very beginning of the dance! She is 69 at this time. 7PM Cubberley Auditorium, 4000 Middlefield Rd. for dedicated dancers, for beginners, and just for fans. Wine, refreshments, history of tango, an introductory lesson, demonstrations, movie clips, songs, music, and dance. Party hosts: Elena Zusmanovich & Boris Vladimirsky. Dance instructors Igor Polk & Teressa. Tickets $30. For reservations, please call (650) 964-6838, Lola. 7:30 - Essential Fundamentals lesson: "Milonga Basic". $10. 8:30 - This is going to be a 1.5 hours workshop. We are going to review 2 previous lessons about "Turn to the Left". Plus one more new figure! 8 figures overall. $10. 8:00 - Close Embrace class. As usual - very useful and exciting. 7:30 - Essential Fundamentals lesson: "Back Ochos". $10. 8:30 - We are going to continue with the turn to the left, introducing some practical dance-floor-useful variations and reviewing of and getting new advice on the last lesson. $10. and these amazing dancers will dance for us soon!!! about 9:30 - Practica. $5, free for students. On March 19 we had a workshop "Action and Reaction" with Luis Bianchi & Daniela Pucci. That was a wonderful evening full with joy and excitement of Tango. Luis and Daniela are very deep, focused, thorough teachers and amazing improvisational performers. They explain the technique on the level very rarely reached by other teachers .Their YouTube video is in my list of the best tangos, but what I saw at Alberto's on Sunday, they performed three dances, supposed to be in the list of the best performance art ever. Bravo! 7:30 - Essential Fundamentals lesson: Introduction to Cross System: "Cross Basic" with introduction to ochos. $10. If you forgot what Cross Basic is, it is highly recommended. As usual - for everyone. 8:30 - We came to the most complex of our lessons: 2 types of a classical turn to the left. $10. Let us check it out if we are ready for that. Mastering these two related figures will make you a king of the dance floor, gentlemen! And that will take time. Let us start ! 7:00 - A lesson for club members. $10. ( Clarification: Who are the club members? The dancers who come to our classes regularly. We welcome you here, if you have heard about this class, but since we are elaborating on learned material, the attendance to Monday classes is highly valuable. Club members have some other advantages ). 8:00 - Classical left turn in close embrace is probably too difficult for us yet. So, we will find what to do having the goal of making you a king or a queen of the dance floor as soon as possible. $10. 7:30 - Essential Fundamentals lesson: "Amazing 8-count Basic". Nothing you've ever seen, a lot of material. $10. 8:30 - We are going to continue with the last lesson's figure. $10. 8:00 - It turned out we have learned boleo at the last lesson. Now, we will come back to what adjustments we have to make to perform the last 4 Monday's figures in Close Embrace. $10. 7:30 - Essential Fundamentals lesson: a lot of material. $10. At this lesson we are going to learn and review 5 similar, simple, but very important and often used figures. 8:30 - A figure which is a mirror of what we practiced the last time will lead us to very unexpected resolutions. Some of the material from Diego and Angelina will be touched. $10. 8:00 - What adjustments we have to make to perform the last 3 Monday's figures in Close Embrace. 7:30 - Essential Fundamentals lesson: a lot of material. $10. It is a good idea to take our fundamental classes as many as you can. They are very complex now. Just taking the fundamentals classes it is possible to become a good dancer. 8:30 - We are going to continue diving into understanding tango fundamental structure on the example of a figure called in some places "Cambio de frente recto corto con pie derecho". $10. This is the same simple figure we learned the last time, only we will explore the left part of it ( we did the right ), and see what wonderful ideas we can come to! 7:00 - A lesson for club members, $10. As usual by your teachers Igor Polk & Teressa. 8:00 - We have a workshop today with wonderful professional dancers from Argentina Diego Escobar and Angie Staudinger. It is only $15 for club members! $25 for other people. These are beautiful and perfect stage dancers of Salon Argentine Tango. The topic is "Figuras lineales y con cambios de frente" which should be suitable for us. Big announcement : Count your lessons! Igor is going to give a free private lesson to any man who have taken 8 weeks of group classes. It can be repeated. Take advantage of this incredible offer !!! No one else in the whole world is doing it. And it is not going to last long. 7:30 - Beginner's lesson #1: "Very simple tango", but a lot of material. $10. 8:30 - We are going to continue diving into understanding tango fundamental structure on the example of a figure called in some places "Cambio de frente recto corto con pie derecho". $10. This is the same kind of figure Colette and Richard and Brigitta have taught. Only now it will be presented in Igor & Teressa's way. 7:00 - A lesson for club members, $10. 8:00 - Close Embrace Apilado. Simple turns to the left, $10. Prerequisite: knowledge of "basic steps". 7:00 - A lesson for club members - answering questions, men's parts of Brigitta figures, $10. 8:00 - A lesson for everyone with the emphasis on the men's role in the dance, $10. This lesson is for open as well as for close embrace dancers. For beginners too. Igor will talk ( and show ) about what is important to be a good man in a dance. Practical advice. Brigitta Winkler is giving workshops and lessons at our club on January 30 and February 4, and at the Elks Lodge on February 3. LAST TANGO @ THE ELKS ! 6:00 p.m. until way past 10:00 p.m.
MILONGA del Espiritu Libre DJ: Bernhard Kohlhaas. Hors d'ouevres, desserts & refreshments - hosted by Dorcas Hendershott. 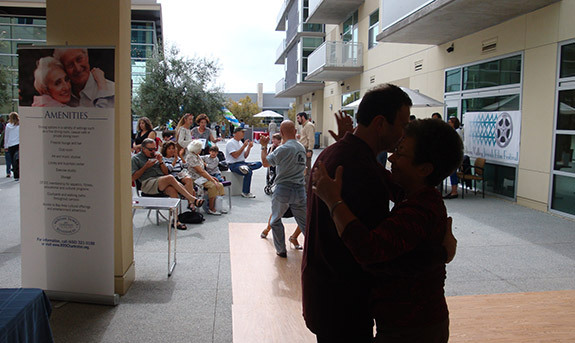 Milonga $12, Stanford students $7 . BA Tango members $10. 7:30 - "Traspie and suspended steps". Even though the lesson is marked for beginners, it covers most important fundamentals of tango: Traspie, tango rhythm, and special feeling of advanced salon dancing. $10. We very encourage everyone to take especially this class. Consider it as a preparation for the Brigitta's workshops. 8:30 - Understanding tango fundamental structure: Parallel (and Cross, if we are able to get there ) systems. $10. Wednesday, January 30, 2008.... Brigitta is here ! 7:00 - Tango Advanced Level ~ What does it mean ? ( Intermediate/Advanced) $15 for everyone. about 9:30 - Practica $5, free for students. Active members of the club are those dancers who regularly take our classes during the last 2-3 moths. 7:30 - "Side steps feeling the dance". Even though the lesson is marked for beginners, it covers most important fundamentals of tango: connection, lead & follow, rhythms, and dance feeling. And promises to be fun. $10. We very encourage everyone to take especially this class and the 7:30-class the next week. Consider it as the preparation for the Brigitta's workshops. 8:30 - Simple turn to the right: "Giro caminado a la derecha con sacada". It is always with sacada. $10. Please, our beginner's classes are very important. You will not be able to make a shortcut avoiding them. On the contrary, solid knowledge of everything what is taught there is essential for the fast progress at the intermediate level. Toward real dancing ! If you haven't taken a class with the specified topic - take it! I'll tell you a little more about it. It is not the amount of theory and number of figures you know what makes you be able to dance, but amount of time you spend moving and dancing. It has to go into your body, and it is a slow process. You have to work those hours. And the best what you can do - do it systematically under the guidance of a knowledgeable teacher and multitude of dance partners. Your mind may tell you: "I've seen it already", but your body does not do it right ! You do not even notice it and may even blame your mistakes on your partners. A teacher at the appropriate level class will point you out to this saving you from hours and hours of frustration and broken dances. It is our goal to make you happy introducing you to the wonderful and fulfilling world of tango dance, and how fast you are going to get there depends only on your dedication. 7:00 - Pre-Advanced class for Monday students. $10. Review of all styles of Ocho-Cortado: Salon, Orillero, and Apilado. 8:00 - " Giro caminado a la derecha con sacada" in Close Embrace Apilado. Simple right turn with sacada in leaning position. ( it is always with sacada ). $10. Note the price is $10 for each class. 7:30 - Orillero Ocho-Cortado for beginners. $10. 8:30 - Last week we have learned Ocho-Cortado in Salon style. Now let us learn what it means in Orillero style. Get ready for fun! $10. 7:00 - Pre-Advanced class for Monday students. $10. Note: this is not a beginner's class! We consider this class more advanced than the 8pm's one. This is for those who want to go beyond Intermediate class on Monday, review it, get more advanced knowledge, and practice important staff..
8:00 - Ocho Cortado in Close Embrace Apilado. Let us see where we can go from here. $10. about 9:00 - Practica. $5, free for students. 8:00 - Close Embrace Apilado. "Making Back Ochos in Apilado". $10. First of all the offer stands: count your lessons, men! 8 group lessons – you get 1 free private lesson with Igor. And here is the New Year gift for women: 1 free private lesson with Igor. The offer stands for any women who took any group lesson in 2007. "Saying good buy to the old year" tango party for Palo Alto JCC Tango Club members and friends. So far we plan to finish sometime around 10pm ( we do not have enough people yet to stay till 12. If you have some ideas – please, share ).